Sloppy Joes…A Meal That Feels Like Childhood! 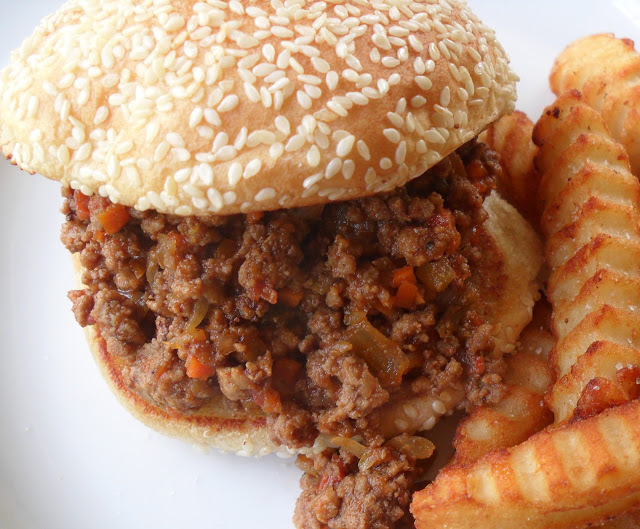 Growing up, Sloppy Joes were a staple favorite for my fella, not only at school but home too! On the other hand, they were something that we only had at school…never, ever at home:( Since we both shared a common bond of love for these sandwiches, after getting married, I knew that they would be something that I’d add to our menu. Over the years, I’ve grown from canned sauce to scratch. Sure, it’s super easy to brown the ground beef and stir in the sauce but, nothing beats homemade Sloppy Joe Sandwiches! Served with fries or chips, it’s like being a kid again. Now, I just need a root beer float! P.S. I also love that it freezes well. I make a double batch and freeze half. 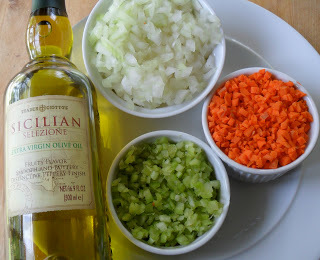 The beginning…olive oil, celery, carrots(both, finely chopped), and chopped onion. Saute with a bay leaf and set aside until ready to use. Add sauteed mixture(remove the bay leaf), pureed tomatoes, ketchup, bbq sauce, chopped garlic, and brown sugar…Simmer and you’re ready to enjoy! Use olive oil to coat the bottom of a large, heavy lidded pot and heat on medium/high until hot. 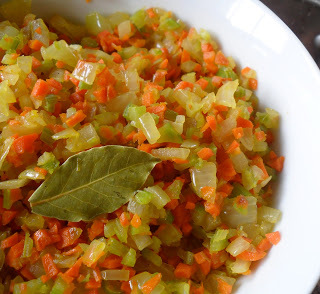 Add carrots and celery, stirring occasionally, for 5 minutes. Add onion and bay leaf and continue sauteing for 5 more minutes, until onions have become translucent and everything has softened. Transfer cooked mixture to a bowl and set aside until ready to use. 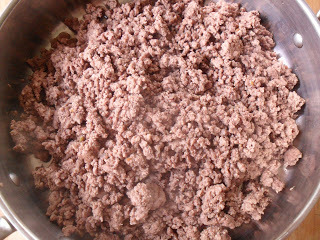 Return pot to heat and add ground chuck, salt and pepper, breaking up and turning as it completely browns. 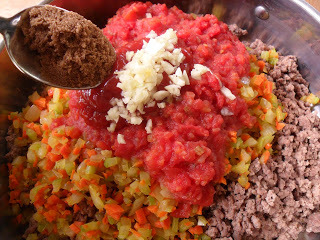 Add onion mixture(remove bay leaf), pureed tomatoes, ketchup, bbq sauce, brown sugar, and garlic to pot, stirring to combine. When mixture begins to bubble, reduce heat to low. Cover and allow to simmer for 30 minutes. Serve on toasted buttered buns. Fries or chips are also a must have! Your Sloppy Joes look so delicious! Such a comfort food and kids love this dish too!